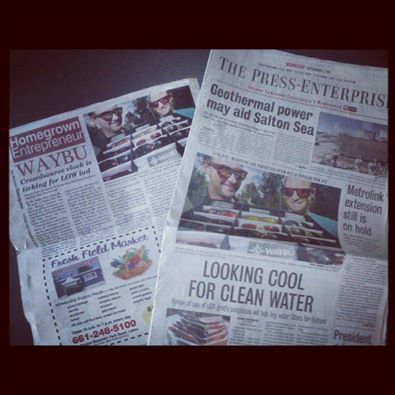 PR or “public relations” is all about getting press and media coverage for your crowdfunding project. This means getting picked up by the press. So you can get your project in various media outlets such as blogs, magazines, newspapers, even on TV! That’s one of my key strategies to getting funded. Why is PR so Important for Crowdfunding? It’s simple: if you do it right, then PR gets your crowdfunding project in front of thousands, or even millions of people FOR FREE! It doesn’t get much better than that. Now, I’m not saying the crowdfunding PR is easy, but it is awesome and very cost effective. I used my proven 5 step PR outreach process to raise tens of thousands of dollars on the projects I’ve launched. For example, I got my crowdfunding idea Waybu Eyewear picked up by blogs across the world, as well as magazines and newspapers. This lead to a FLOOD of backers contributing to the project. You can literally get the money pouring in with the right PR strategy. How Do I Get PR Coverage Too? Its hard for me to give generic PR advice. I need to know what your project is all about to focus on the best angles and media outlets. In other words, every crowdfunding project needs a custom PR strategy behind it. I work with projects in all major categories to help them craft a winning PR strategy. You want to make you project newsworthy and find out what makes it stand out. The Crowdfund King program includes full training on how to rock PR and get massive coverage for any type of crowdfunding idea you may launch. If you have an awesome crowdfunding idea and you want to make money with crowdfunding, then apply for my Crowdfund King program by clicking the button below!